The comprehensive plan should be used to change, grow and develop Portland in the coming years. 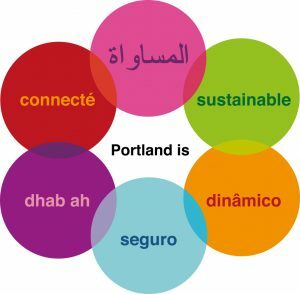 The vision for Portland – “equitable, sustainable, dynamic, secure, authentic and connected” – is translated into some of its most-spoken languages: from top, Arabic, Portuguese, Spanish, Somali and French. Lisa Whited is a member of the Portland Planning Board. She can be contacted at [email protected]. The state mandates that Portland draft a new comprehensive plan every few years. Portland’s proposed comprehensive plan, which was recently approved by the Planning Board and is to be voted upon by the City Council on Monday, serves as a guide, as a resource and as a decision-making framework for conversations about our economy, environment, waterfront, transportation, housing, recreation and open spaces, facilities and historic resources. One of the first steps of a planning effort is the inclusion of as many stakeholders as possible in imagining a vision. This step is critical: We know from change management best practices that the more inclusive an outreach effort, then typically the more happy people will be with the final result. Portland’s Planning Division used numerous methods to solicit input from city residents about their vision for a future Portland. These included large community forums at the University of New England and the Portland Public Library. They included mid-sized neighborhood association meetings and more intimate gatherings with people from Homeless Voices for Justice, the South Sudanese Community Association of Maine and the Global Shapers Hub. There were one-on-one conversations with people at the Deering Oaks farmers market and school open houses. People who are not typically involved in an effort like this, such as ninth-graders from Portland High School, were invited to articulate their vision for the Portland they wish to live and work in. (After all, when we imagine our future city, people who are 15 years old today are the ones we hope will choose to live here when they are 25.) Outreach also included an electronic survey, which had an initial return of 700 but was boosted with community effort through social media to a final return of over 2,100 responses. A comprehensive plan may not seem like an exciting document to dig into; however, this plan was purposefully designed to be visually accessible. Consider reading it instead of that old copy of Sports Illustrated at your next doctor’s appointment. Give the comprehensive plan (found at tinyurl.com/y7g6ff22) a once-over and I guarantee you will find something that pulls you in. Whether it is the Portland’s Plan In Action flow diagram on Page 12, the Priority Nodes and Corridors Map on Page 86 or the Historic and Archaeological Resources on Page 140 in the appendices, there is something for everyone in the newly drafted comprehensive plan. And that is exactly the point: Portland’s new comprehensive plan is by the community and for the community. It is not the vision of a singular person – not the mayor’s vision, the city manager’s vision, the planning director’s vision or even the City Council’s vision. It is the city residents’ collective vision. When considering a potential project, a new initiative or a change to an ordinance, one of the first questions to ask is: “How will this (fill in the blank) help us achieve a vision of an equitable, sustainable, dynamic, secure, authentic and connected Portland?” The city’s comprehensive plan is your document and can be used to guide conversations among all of us about how to change, grow and develop Portland in the coming years.